Tradesmen Electric is a Battleground, WA based electrical contractor. The family run business has been serving the electrical needs of the greater Northwest since 2005. They’ve built their reputation in the residential market as one of the most reliable electrical contractors in the area. Those same values have been carried along as they’ve expanded into the commercial and industrial sides of the industry. Tradesmen’s team of highly skilled electricians provide expert installation of electrical and lighting products for just about any type of commercial, industrial, and residential project. Tradesmen Electric had grown tremendously in the past decade and their site at the time was inadequately representing their offerings. Tradesmen came to us wanting shake things up a bit. Their company had grown tremendously in the past decade and their site at the time was inadequately representing their offerings. Additionally, portions of the site had started to deteriorate and simply not work. This left huge gaps and odd, blank pockets in their content. We approached the project with the idea of looking towards the next decade and the increased growth the company is likely to experience. Growing from a few hundred thousand dollars a year in revenue to a multi-million dollar company requires a different level of approach as to what is public facing. Tradesmen was concerned with not letting their residential services decline because they were perceived as “the big guys”. We incorporated all of their services in the same way so that there was no differentiation in one services importance over another. Greater attention was also given to their news outlets. The previous site had a blog, but we decided to create a dedicated news section (apart from the blog) to support corporate messaging and press releases. The site was left open and airy around page elements to give the space a larger feel while still using some bounding boxes and imagery to help organize the large amounts of content required on the site. Much of the clientele that Tradesmen Electric comes from people in the field—contractors, carpenters, foremen, architects. As such, they needed a site that worked on multiple devices and could be viewed by potential clients regardless of their location or device. Our solution was to build a site that seamlessly scales down to smaller sizes providing potential clients access to the breadth of Tradesmen Electric’s services in a device agnostic environment. 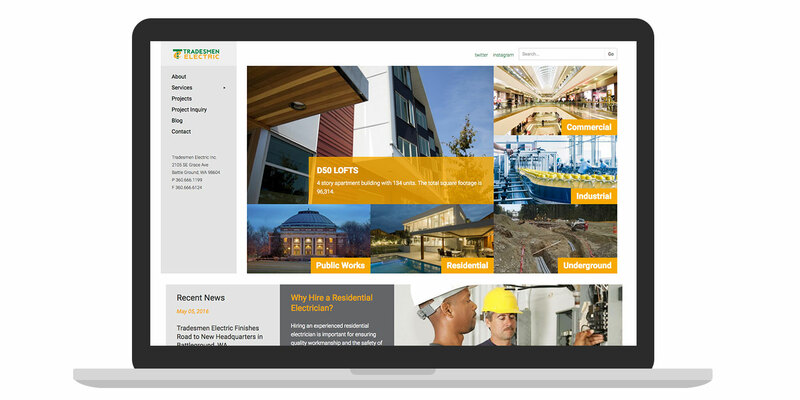 At full width, the Tradesmen website home page provides an overview of the variety of work and services offered by the Battleground, WA based electrical contractor. At smaller device sizes the site re-orients itself to accommodate a smaller viewing space while not sacrificing the user’s experience. One of the biggest challenges we faced in this project was how to adequately represent the breadth of services Tradesmen has to offer without making things convoluted. We increased our page count on the site by roughly 50%, but we used very specific tiers of taxonomy and categorization to help prospective clients easily navigate to the specific areas of the site they were interested in. We designed the home page to provide high level views of the types of content available to the user on the site. We implemented clear service categories to assist in navigation and the user experience. News and company information channels were also placed right on the front page to give client access to important updates. 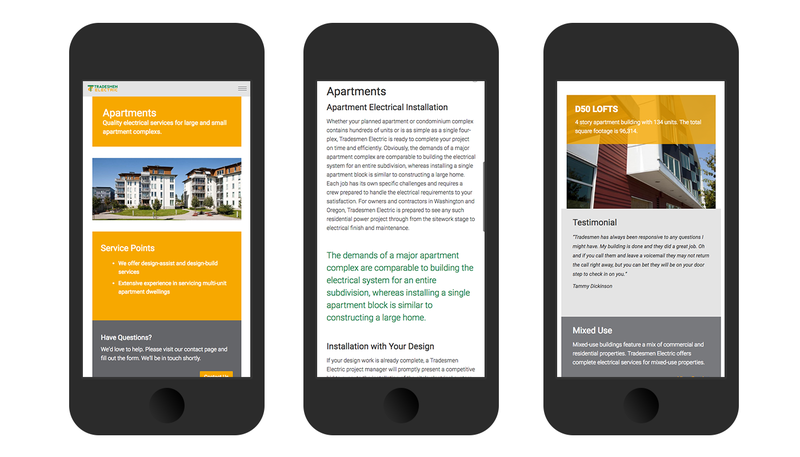 Service and interior pages were designed to give detailed information about each respective service, while allowing users to read service specific testimonials and explore relevant projects around each core competency. The homepage of Tradesmen Electric was designed to provide a clear look at the diverse types of electrical contracting work the company does.